Welcome to The Seeing Eye Organization, a registered charity based in Toronto that provides assistance to Canadians who are blind or visually impaired, specifically through the procurement of guide dogs to enhance their ability to work and travel. Rev. 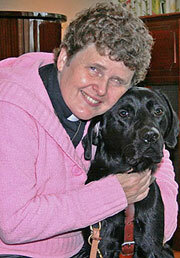 Dr. Sharron Ballantyne with her Labrador retriever Wilson, her fourth Seeing Eye dog. Since 1939, Canadian students have been attending The Seeing Eye in Morristown, New Jersey, to learn how to care for and work with Seeing Eye® dogs. Each year, between 15 and 18 Canadians graduate from the school with their Seeing Eye dogs, ready to take on the world with a renewed sense of independence and dignity. Your donation to The Seeing Eye Organization will help Canadians be matched with these amazing dogs. The Rev. Dr. Sharon Ballantyne of Peterborough, Ontario, was paired with her fourth Seeing Eye dog, a black Labrador retriever named Wilson, in October 2012. Sharon is a full-time third-grade teacher and also serves a small rural pastoral charge as an ordained minister in the United Church of Canada. "These dogs exemplify love, partnership, dedication, commitment and faithfulness," she says. 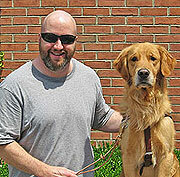 Mark Callaghan with his second Seeing Eye dog, a golden retriever named Javon. Please help blind or visually impaired Canadians further enhance their independence with a gift to The Seeing Eye Organization. The Seeing Eye Organization is a Canadian registered charity under the Income Tax Act (Canada) with charity registration number 891008690 RR0001. Your donation is eligible to be receipted for income tax purposes. If you are a Canadian interested in applying for a dog, or would like more information about The Seeing Eye, visit their website.